6 Nights accommodation for a Couple. As of now airfare in the package is calculated at Rs. 45,000/- (per person). Any increase in the airfare to be Paid Extra. Welcome to one of the most beautiful islands on earth- Mauritius. On arriving at Mauritius airport, meet our local tour co-ordinator at the specified area and he will transfer you to the hotel. Check-in and relax. Evening is at your own leisure. Step out in the evening and get acquainted to the nearby areas and beaches. Have your dinner and retire to your room for the night. Take a fill at morning breakfast and set out for a super fun day at Ile Aux Cerf, a perfect place for water sport lovers. Enjoy a speed boat ride across the island to Ile Aux Cerf (Please carry swimming suits, towel & sun screen lotion). Indulge in exciting water sports (on your own expense), relax on the gold tinged sand beaches and enjoy the action around you, lay lazy basking in the sun or go for an occasional swim in azure sea water. Return to the hotel in evening. Later have dinner and enjoy a relaxed sleep. After morning breakfast, the day is free at your own leisure to spend it in your own preferred way. You may relax in hotel premises enjoying the several in-house facilities, go out for self exploration or join us for an excursion on Catamaran Cruise (on an extra cost). It is a very famous attraction of Mauritius. Getting aboard the cruise, sail over the deep sea, explore the nearby islands, snorkel in the inviting waters and discover unspoilt beaches on your way. Later return back to the hotel and enjoy a hot Indian dinner. Wake up early to witness the stunning sunrise hues on the beach. Later have a leisurely breakfast at hotel and plan how you want to spend your day. Today you can choose to spend the day in clear water blues by opting for Blue Safari Tour (at an extra cost). The tour includes submarine and sub-scooter ride to experience the amazing underwater life in a unique way (Carry your swim suits and towels). Be seated in your submarine while it takes you to the unseen depths of the ocean where you’ll see the unmatched beauty of the complex and fragile marine world. Take a sub-scooter and drive in the water while a professional diver will accompany you as guide. It is a truly evoking experience that surely must be on top of must-to-do things while in Mauritius. Later return to hotel, have dinner at night and enjoy a deep sleep. After taking a fill at morning breakfast, proceed for a full day North Island Tour. Visit Port Louis, the capital city of Mauritius. Drive through Labourdonnais Avenue and discover the old French Colonial buildings, the imposing Government House and the picturesque modern architecture. See Champ De Mars, the second oldest racecourse in the world and the Fortress of Citadel. Drive past the UNESCO heritage site Aparvashi Ghat, visit the Harbour and take a halt at Caudan Waterfront Square where you can enjoy some free time for shopping in the Port Louis Bazaar and see the commercial city. Later visit Casela Nature Park, which is spread over an area of 250 hectares of rugged terrain, lush forest, scorched-earth safari and breath-taking gorges in the mountain area. One can explore the company of tamed animals, get the opportunity to touch the Big Cats & many more activities such as- Quad Bike, Segway, Zip line, walk with lions, interaction with lions, Tulawaka, etc. (at extra cost). After Casela World of Adventures tour, return to the hotel and have dinner in one of the restaurants in Hotel. Must produce Wedding Certificate / Card, that should not exceed to 6 month from the Wedding Date. 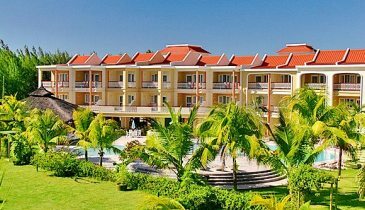 Mauritius Visa on Arrival is Free for Indian Passport holder's. Incase of any unprecedented hike in Airfare, Hotel charges or other service charges, the same will be levied extra. Check in time is 1400 Hours and Check out time is 12 Hours noon. Early check-in / Late checkout are Subject to Availability. Date and Timings of the above Tour Program can be changed by local tour operator. Room type Twin or Double is at sole discretion of Hotels. Hotels allocate the rooms on Run of The House basis. If cancellation is made any time 31 days or more from the date of Departure, Rs. 10,000/- (except Normal ticket cancellation charges) shall be deducted. If cancellation is made 30 days or less, but more then 15 days prior to Departure, 40% of tour cost shall be deducted. If cancellation is made 14 days or less, but more then 07 days prior to Departure, 60% of tour cost shall be deducted. If cancellation is made 06 days or less, but more then 03 days prior to Departure, 80% of tour cost shall be deducted. If cancellation is made 3 days or less or in case passenger is no show at the time of departure, 100% of tour cost shall be deducted.